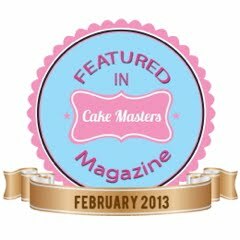 This post is all about how li'l old me's cake came to be featured in the fabulous Cake Central magazine. 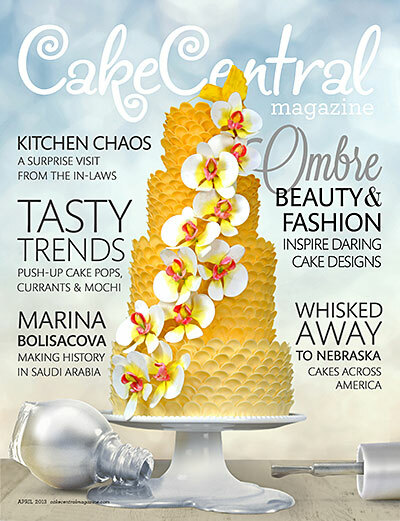 Back in February, I received a very exciting email from Cake Central Magazine, asking if I would like to decorate a cake to appear in their magazine. 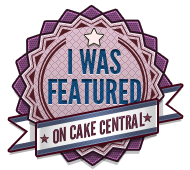 If you use Cake Central too, you can find me here. I has been an ambition since childhood, to have my work published in paper form, but, I never expected that my first printed work, would be a picture of one of my cakes..
Once I had agreed to the cake decorating task, I was sent the inspiration for my cake. You can see the inspiration picture on page 48 of the magazine. This is a hard part of the process for me, as I am used to having free reign when making a cake, or just some outlines for what is required. Even harder, was that the inspiration picture I was given was mainly white! I am not keen on working with white, mainly because I find it really difficult to photograph well and I was going to have to photograph the finished cake to send to the magazine. A little artistic licence and creativity was going to be required here. The biggest challenge though, being a busy working mum and all that, was finding the time to make this cake. Fortunately, my lovely, kind and considerate husband took our son to his mothers one Saturday afternoon and this was my cake decorating window. I had a few ideas of what I thought I would make and also flicked through some back issues of Cake Central, to remind myself of the sort of cakes that were usually featured. Flicking through the previous issues made me feel rather anxious and a little unworthy of this challenge. I knew I couldn't make a cake as formal and grand as those featured, even if I might have the skills, I simply didn't have the time. As well as being inspired by the photo, I was also told, the cake had to feature an ombre or colour graduation effect. 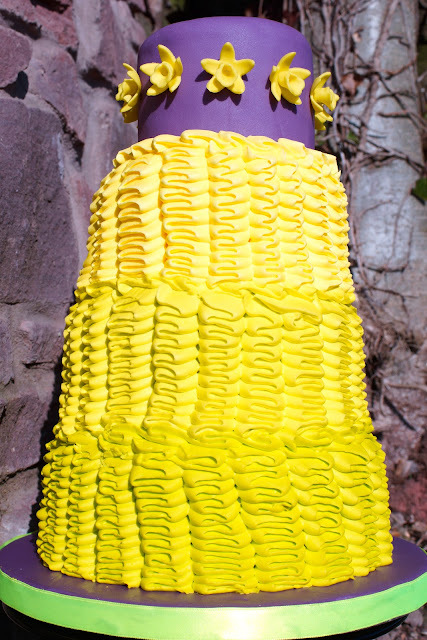 I settled on the cake design you see here, piped ruffles in royal icing, graduating in colour in spring time hues of zesty lemon and lime and set off with a little dark violet to make the other colours pop, hoping that this would be reasonably quick to decorate and eye-catching enough for the magazine. I made up a big batch of royal icing and then played a little colouring roulette as I had to guess how much of each colour icing I was going to need to pipe on to each tier. One of my aims for this year is to learn how to make sugar flowers and I started this design by crafting a large zesty green cymbidium orchid like those shown in the inspiration photo, intending to perch the orchid, at a jaunty angle, on the top of the cake. Having finished my ruffle piping, I gently set the orchid in place and it just didn't look right. 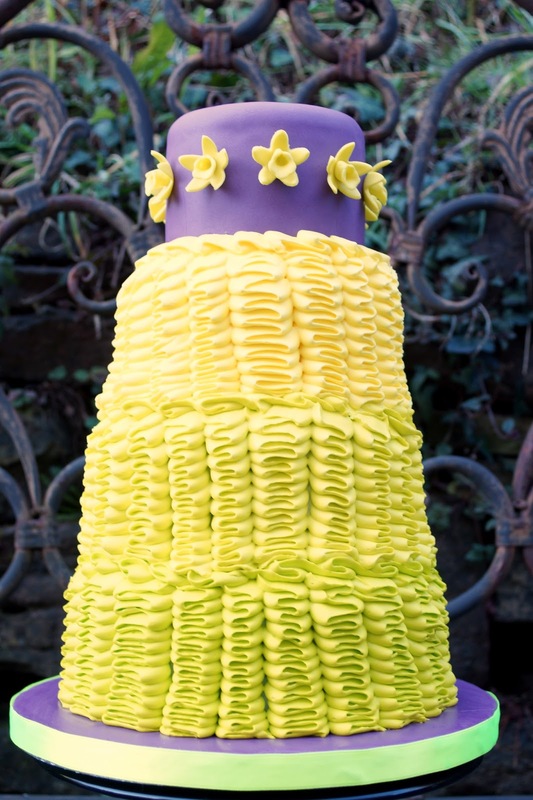 Somehow looking too formal and out of place on this whimsically styled cake. I then set around making a dozen or so of more stylised mini orchids, which I think suit this cake a lot better. The next day, I took my photos and sent them into the magazine. 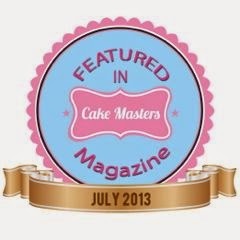 And then, sometime later, another lovely email arrives, telling me that my cake had been featured in the magazine and including a badge, which you can now see proudly displayed at the side of this page. 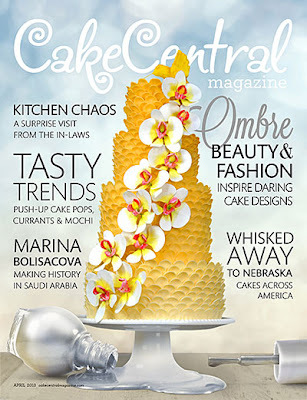 So, if you see this magazine, open it up and you'll see my cake! I have only seen it in electronic format, as I have not found the paper version of this magazine here in England, but I still feel rather proud.